How can I add Google analytics to my Customizr website? If you are using Customizr Pro, you can paste your Google Analytics tracking code in a specific field designed for that. This option is available in the live customizer > Advanced options > Additional scripts. 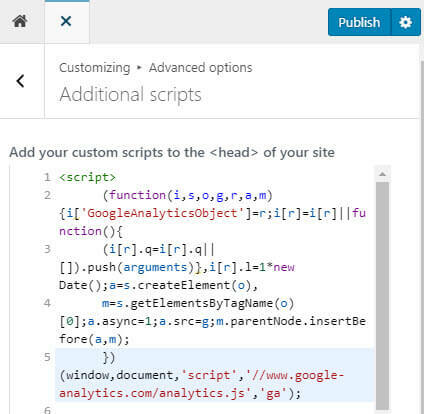 For users of the free theme, you'll find a complete documentation about adding your Google Analytics tracking code with a plugin or a custom snippet code here.